The Gonzaga women will take on Saint Mary’s in the McCarthey Athletic Center at 2 p.m. The men will be on the road against Saint Mary’s starting at 5:15 p.m. (ESPN2 College GameDay primetime broadcast). This year the University celebrates “Gonzaga Will,” the theme of its capital campaign, and major milestone campaign updates will be announced. 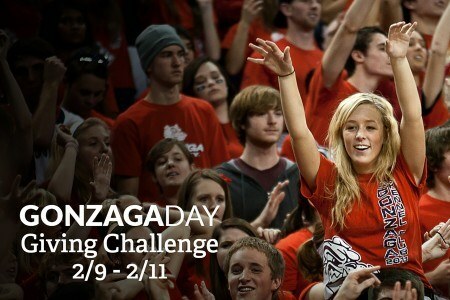 For more information about the excitement planned for Gonzaga Day on Feb. 11, visit http://www.gonzaga.edu/gonzagaday. Text GONZAGA to 51555 to enroll in Gonzaga University updates about Gonzaga Day and other events and opportunities. To participate in the three-day giving challenge, visit http://www.gonzaga.edu/zagsgive.